Feuerstein goes on to explain that when he visited a Starbucks store, he told the employee making his drink that his name was “Merry Christmas” so that his cup would read “Merry Christmas.” He later says “Guess what, Starbucks? Just to offend you, I made sure to wear my Jesus Christ shirt into your store, and, since you hate the 2nd Amendment, I even carried my gun!” Three days after the initial post of the video, it has over 130,000 likes and 380,000 shares. 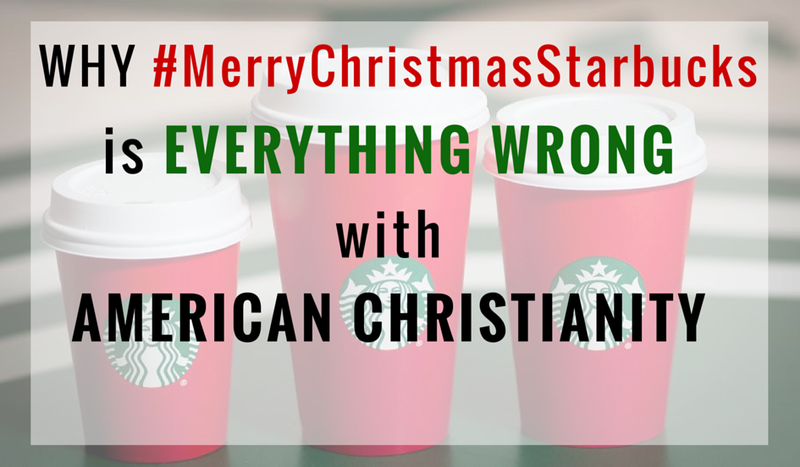 Feuerstein has started a #MerryChristmasStarbucks campaign in which he urges other Christians to post pictures of themselves performing the same prank in an effort to stick it to Starbucks and keep “CHRIST” in Christmas. This, my friends, is complete and utter ignorance. This, my friends, is the reason my fellow students at Colorado State University think I’ll hate them when I tell them I’m a Christian. This, my friends, is why my African-American brothers and sisters are left begging for answers from an evangelical community who turns a blind eye to their suffering. This, my friends, is everything wrong with American Christianity. Full disclosure: I’m now a Starbucks employee. I’m also a follower of Jesus. I also have no issues with the new plain red Starbucks holiday cups. As I start my job as a barista at Starbucks in the coming weeks, I’ll probably familiarize my taste buds with the Starbucks Christmas blend – yes, Christmas blend – by drinking from these plain red cups. I do have issues with #MerryChristmasStarbucks, though. Most of American Christianity’s blatant problems are exposed in this one excruciatingly real social campaign. “If Jesus was to walk the earth today and enter the nearest Starbucks, what would his agenda be? Would he zero in on the closest employee and tell them to write, “Merry Christmas” on his peppermint mocha? Would he then smile smugly at the pained barista who had nothing to do with the corporation’s decision to implement a new design? Would he later boast about it to all his friends as they marvel at his moral victory? Or perhaps Jesus would choose to order his coffee and ask the barista how her day has been. Perhaps he would invite her to sit with him during her break so he could get to know her. Christian, would he not choose to love her? Invite her to church, tell her what he did for her on the cross, explain grace and mercy, ask how he could serve her with the same humility he demonstrated 2000 years ago? Beautiful. Profound. This looks more like the Jesus I know. This looks like a more accurate answer to “WWJD” than choosing to “offend” Starbucks and their disdain for the 2nd Amendment. As I consider what Jesus would have done upon walking into a Starbucks and finding a simplified red cup, a word I’ve been pondering lately comes to mind. What’s meekness? Good question. It’s a tough term to define. I once heard Jefferson Bethke (a dude whose biblical stances on social issues I’d recommend paying attention to, by the way) call meekness “the inability to be offended.” That struck me hard, because I’m someone who struggles with being easily offended. Meekness is an extremely difficult characteristic to develop, because… what about my pride? What about my ‘being right?’ What about the fact that American corporations are trying to take Christ out of Christmas? Meekness, however, is a fruit of the Spirit. In the Beatitudes, Jesus says “blessed are the meek, for they shall inherit the earth” (Matthew 5:5). When Jesus went to the cross and died for my sins, your sins, and the sins of Starbucks’ governing board, he showed the epitome of meekness. When he saw the sins of the world, he wasn’t offended. Instead, he was heartbroken. He went to the cross with full knowledge that Starbucks’ corporate decision-makers would one day change their holiday cups to a simple red design in an apparent attempt to take his name out of the season that exists only because of him. He subsequently died for their sins anyway, in hopes that they, too, would accept the free gift of his all-consuming love and live with him for eternity. When we’re offended that Starbucks changes their cups, we completely fail to show the Christlike characteristic of meekness. Instead, we settle for the moral upper hand. Another reason #MerryChristmasStarbucks is everything wrong with American Christianity is its improper, miscalculated expectation of Christian values from a non-Christian entity. Simply put, Starbucks is not a Christ-centered company. That doesn’t make Starbucks bad. In fact, Starbucks employees – many of whom are Christians, like myself – often show Christlike characteristics in their jobs, even if they do so unknowingly. Starbucks is a very friendly, comfortable place where millions of Americans enjoy drinking tasty coffee. What Starbucks’ position as a secular entity does imply, though, is that we shouldn’t expect the corporation to make decisions based on Christian tradition or Christian values. What if Starbucks’ holiday cups were black? What if they featured upside-down crosses? What if they were embroidered with pentagrams? If these outlandish scenarios were in fact realities, I’d hope that Christians would be no less surprised – and no less offended – at the changes. Yet at the simple change to red, we’re shocked, offended, and filled with an anger that’s anything but righteous. This is sick and twisted. Jesus loved us while we were at our worst. In fact, in the words of Matt Chandler, without Jesus, even at our best we were utterly offensive to God! But he still loved us as his own, still chose us, and still appointed us to be representatives of his sacrificial love. Sadly, we’ve chosen to settle for spreading around our political opinions, allowing ourselves to be filled with pride after our preaching to the choir garners praise from those who already agree with us. We’ve settled for the sickness and self-righteousness of moralistic therapeutic deism rather than the life-changing and eternally powerful message of the Gospel. We’ve settled for religiosity, which frankly doesn’t attract anyone to Jesus. Instead, our moralism repels potential believers while we high-five our fellow Christians for sticking it to the man. News flash: Jesus already stuck it to the man named death so that we wouldn’t have to. Stop expecting somebody to behave like you and agree with you before you love them. If Jesus expected perfect behavior out of you as a requirement for spending eternity with him, you’d be doomed from the start. Lastly, Boko Haram has killed 3,500 people in terrorist attacks in Africa this year, many of which have targeted Christians. Up to 340,000 people have been killed in the crisis ravaging Syria over the last four years. ISIS continues to target both Christians and Muslims as it terrorizes the Middle East. Don’t forget, about 30 million people are currently stuck in the horrors of modern slavery. Let’s also add the racial injustice that’s drowning America in turmoil. But hey, have you seen those new Christ-less Starbucks cups? Great Article. Unfortunately things aren’t any better here in Europe. Just because someone has a difference of opinion, doctrinal beliefs, or theological differences than yourself doesn’t mean off the bat you are involved in being persecuted. I can understand the confusion and questions raised by people in other countries and people groups living in poverty or are actually facing real physical persecution. Many are blindly chasing the American Dream which is tolerance, acceptance, and leave me alone. The Christian’s dream should be to focus on and actually live out the Word of God, accept the Word of God as the truth and love those around us until they see the strength in following Christ, and don’t be an island but seek out other believers who may not carry the same Christian doctrines but to know our main focus is to proclaim Christ and not to proclaim the world. I have quite a few bags of Starbucks and enjoyed living near one, but once my supply runs out I’ve been thinking about getting a bean roaster and roasting my own and sharing it’s goodness with those in the community around me. God Bless! This is so great ! And I think so many people agree. Sometimes I really think ultimately it all leads down to kindness. “Rue” makes her debut appearance in the Global entertainment scene. Promises a take over from 2016. I think your dead on when you say American Christianity, which is distinctly different from those who actually endeavor to apply the teachings of Christ. It is time many who call them selves Christ followers but succumb to the rantings of American Christianity preachers wake up and smell the coffee. The holiday season has ended, but I’ve just stumbled upon this and must concur with others…this is a phenomenal post! Thank you for sharing the truth in love, and the funnies too! As Christians, we must remember that we don’t have it all together and need to humble ourselves as children. After all, that’s who enters the kingdom. Those like children. You’re right. If agape, unconditional love was present in this situation there would be no hashtags…there would be no guns. There would be no discrimination of colored Starbucks cups (ha)…nope, because rainbows are caused by double reflections of light like Christ, which contains much more than red. The fact that Christmas isn’t really biblical is an entirely different topic in itself, but I believe Christ is more concerned about the people than the cups and the business. Coffee has never been his “thing” anyway, but we have, and for that I’m grateful. Thank you for this. This needed to be said and couldn’t have been said any better. I’m SO sorry that I’m just now reading this post! It’s the most EXCELLENT thing I’ve read in a very LONG time! I was beginning to think something must be “wrong with me”, because I feel that “Christianity” has become as hateful and unloving as the World it claims to want to reach for Jesus. I’m almost embarrassed to be called one of them. I’ve often wondered what Jesus must think about what’s going on in Mainstream Christianity??? I think you summed it up most excellently! And, I think that He would be heart-broken that the people He died to save, hate His guts because of the actions of His Church!! Just like you mentioned Jesus would probably invite the Barista to come and sit with him… I believe that He’d invite homosexuals, and prostitutes, and even atheists to come sit with Him also… His heart’s desire is to get to know EVERYONE!! And that they would “see’ how much He loves them!! He did that when He walked this Earth… And, He wants His Church to do this here and now – in His absence. Sorry for the LONG reply, lol. I just wanted to “Thank You’ for this well written, heart-felt post. Great post! I heard a lot of controversy over the cups during the holiday. None of it made sense to me. I thought the point of the plain cups was for people to be able to doodle on them. The idea of Starbucks being Christ-less was kind of funny seeing that most stores decorate for Christmas with the same type of stuff the goes on their usually decorative cups. People make such a huge uproar about these things but are still faithful customers,lol. Real Christians do not celebrate 25th of December as Christ’s birth and that’s biblical. So real Christians do not care about this merrychristmastarbucks thing, because in the first place the catholic (do not confused catholic with TRUE CHRISTIAN in the BIBLE) christmas is just a blatant lie made up by the Roman Catholic Church years and years ago. Sorry. Just being biblical. Find out more info about this. search Bro Eli Soriano and he knows everything in the Bible. http://www.mcgi.org He is the one who knows real Christ’s teachings and sorry but your “merry Christmas” isnt included. The bible states a different “christmas” not the commercial “christmas” that the catholic has been celebrating. I think we Christians should know that Jesus Christ had finished the battle for us, all we need is to show more love and meekness just like Christ Himself. Though it may seems difficult but with our God all things are possible. The Bible (The Word of God) should always be our watchword. The Lord God will help us all and continue to uphold us till He comes. Let us remember to pray for those persecuted. Jesus is The Lord. Reblogged this on Rahul jalotra official page. So deep! I really enjoyed reading this. Thank you so much for your in depth analysis. God Bless you my friend. I’m so glad it was encouraging to you. After reading this post, I’ve had a rethink of what being Christ-like means. I found your article about #MerryChristmasStarbucks a very profound and a resounding echo of my very soul not just because my Love of Christ is saddened when , in Ca. all the merry Christmas’s are no longer allowed to be repeated to patrons , only season’s greetings and other non Christ greetings. This is a loving gesture said to all cashiers and worker’s for as long as one hundred plus years. But because I know it’s not the employee’s decision , I have meditated with Jesus ‘s want for us to Love other’s as he has loved us . So I try to convey “God Bless You and have a very merry Christmas ( to Ms Sir etc ). Most times I hear Happy Holidays but quite often they share my thoughts and say Merry Christmas to you too. Now I am aware as Jesus Christ once said to his disciples ” you see as men of the earth and flesh , you do not understand to see as the Spirit and my Father and I do”. He said “this one commandment I give to His Disciples (as He washed all the Disciples feet ) to do this for one another brethren and love each other as my Father loves you . For in a while he told them he’d be gone ; however Jesus explained it was written and I must do this for you all and my people . To truly be a Christian we all have sinned , however Jesus would ask them to repent and be baptized , when they wanted to be His Followers . Many Many times we forget to forgive and love our fellow brethren ; man has to be a doer , of kindness and sharing to others who need , not one full of hate or vanity ! It is easy to mock or judge others , but Jesus said we will be judged as we have judged others ! No where in the Bible is mentioned that Jesus HAD his birth on a specific date!! This is a date made up by man! The truth about the birthdate is because christianity was about to loose its importance due to other occult sceneries. Therefore it was made up that christ was born on this date and everyone could celebrate the same date!! Good post, brother! What a way we have to go as Christians! It is odd how angry and offended statements gain any traction in the Christian church, but it is because of the carnality of our hearts that we turn t o these tactics. All in all, Christ is not glorified. People are not invited to Christ by this campaign. I work and live in/around manhattan. I’ve luckily been isolated (to a degree) from this brand of Christianity. I applaud you, and your friend Caleb, for embodying the spirit and not just the letter of the faith. Reblogged this on ITunu's Journal. I was just watching the live version of “Heart of God” by @hillsongyoungandfree on YouTube, and I noticed this frame as the camera shot panned to the crowd. It appears to be a father worshipping with his two children. ⠀ It struck me deeply. The son on his right is in tears, presumably moved by the Spirit, maybe releasing hurts of his heart to Jesus. Meanwhile, the father is in tears as he lifts up the arms of both of his children in worship. ⠀ Isn’t this what God is like? Lifting up our arms when we can’t lift them ourselves, feeling the things we feel even deeper than we’re able to feel them, weeping when we weep (in joy or in sorrow), standing behind us to support us when we fall yet going before us to lead us in the way we should go? ⠀ Many of us struggle to see our Heavenly Father the way He truly is, whether it’s because of our own doubts or a twisted image of fatherhood the world or our own fathers have given us. ⠀ I think this is what He’s really like. The guy in the middle left for 6 months today. He is going to Norway for 3 months with @ywam_org and then to do outreach in other countries for another 3 months. My brother is one of the most passionate and selfless people I know. If you ask him what his goals are, he’ll tell you that he wants to serve people and tell them about Jesus. Period. He doesn’t care what’s in it for him. What’s in it for him is the pure joy of being used by God. I have no doubts that he will do amazing things as God works in and through him during this time. Please pray Isaiah 43:4 for Ben along with me: “Since you are precious and honored in my sight, and because I love you, I will give people in exchange for you, nations in exchange for your life.” ⠀ Please pray that in exchange for Ben’s service, people and nations would be saved. ⠀ For a long time, Ben looked up to me. He wanted to be like me. He imitated me in hopes of being like his big brother. Now, I look up to him (and not just because he’s taller than me). He’s an example to everyone around him. I am proud to be one of the three Lake men, and I am blessed to learn from the other two every day. I desire to be half the man of the two men standing next to me, and I want to be like my little brother when I grow up.